We must be back in the USA. We all got here safely but many are struggling to get home, with many flights cancelled. Days ago, our students in the New York area volunteered to take home anyone stranded overnight. The ground is covered with snow here in New York, a reminder of many snowy days we encountered during this month in Europe. Our exploration of the European Union took us from Belgium,to Luxembourg, Latvia, Estonia, Lithuania and Italy. We were in about 14 different cities. We saw the places where Western civilization was born and the places where 20th century madmen tried to end it. We stood on the ground where the first attempts were made to organize Europe thousands of years ago and the ground where laws were passed in the newly organized Europe just days ago. We saw the worst of what people can do to others in places like the Rumbula forest in Riga and the KGB Museum in Vilnius. And we saw the best of people in the work being done at the orphanage in Parpacci and the courageous stance for human rights that probably has our Belarusian friend in jail right now. We made new friends and had the privilege of talking with well-informed people who gave us insight into the European Union. 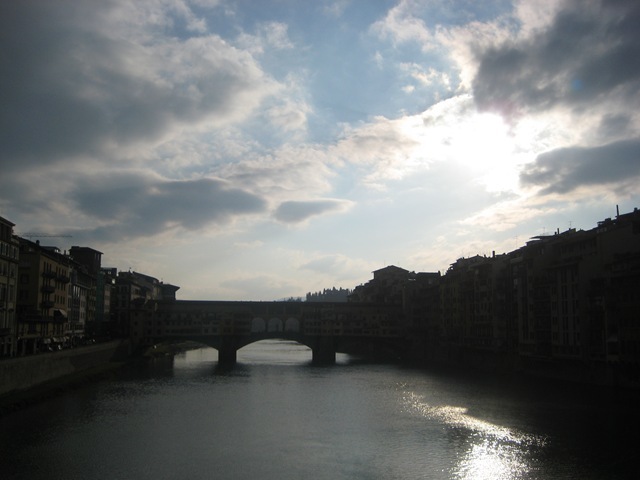 No matter where we traveled we saw great beauty: in the old town of Estonia, along the canals of Bruges, by the Ferris wheel in Riga, at Madame Butterfly in Vilnius, at the old medical college in Bologna, by the Duomo in Florence and the Vatican in Rome…and in so many more places. Everywhere we turned there was something new to take our breath away. But one of the most beautiful things on this course was how well everyone travelled together and how much we learned from one another. We are all lucky and privileged to have this opportunity. We are excited to see what our students will do with this experience in the years to come. 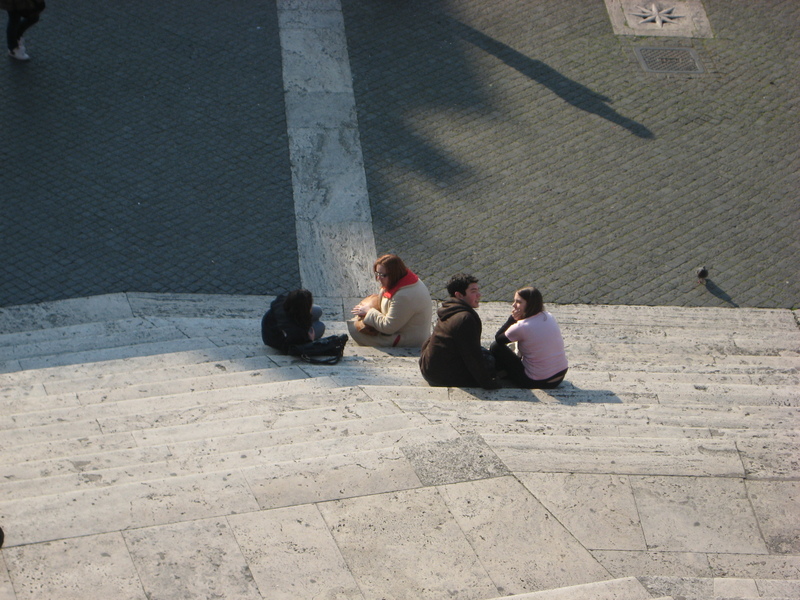 Stay tuned to the student tab on this blog for some final thoughts from our students….to be posted sometime next week. Thanks for following our adventure. Florence has been good for us. 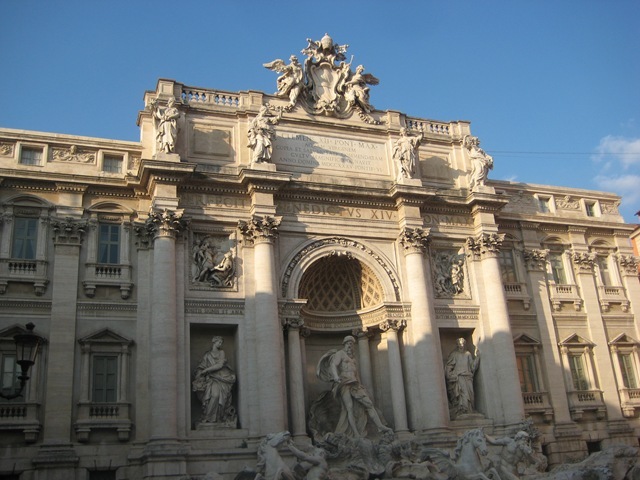 The history, art and culture help us better understand the modern European Union. Over the last few days we have had many lectures by Dr. Morgan and great chances to explore, interspersed with some shopping opportunities. 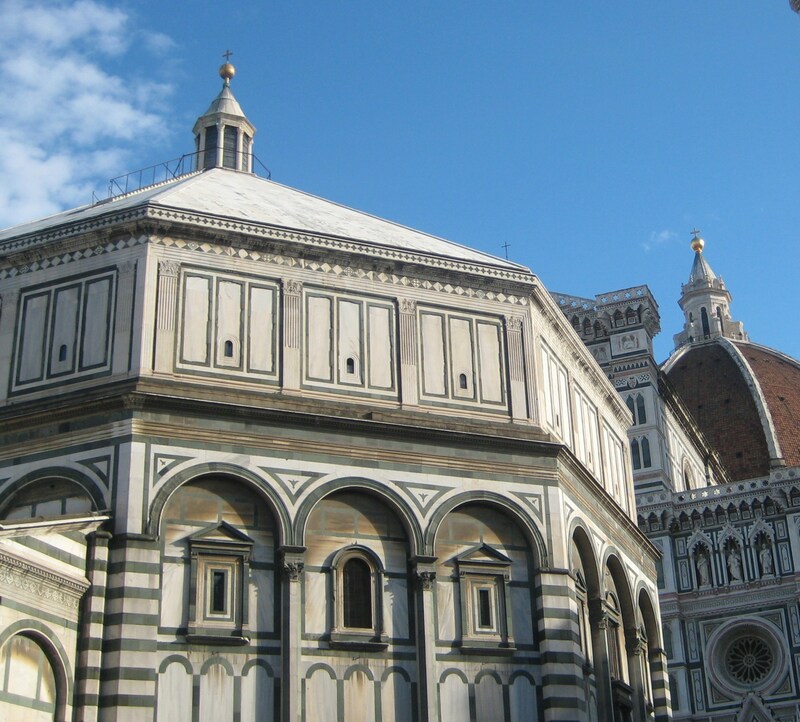 The last few days have been filled with lectures, excursions to neighboring towns in Tuscany and opportunities to explore the joys of Florence on our own. 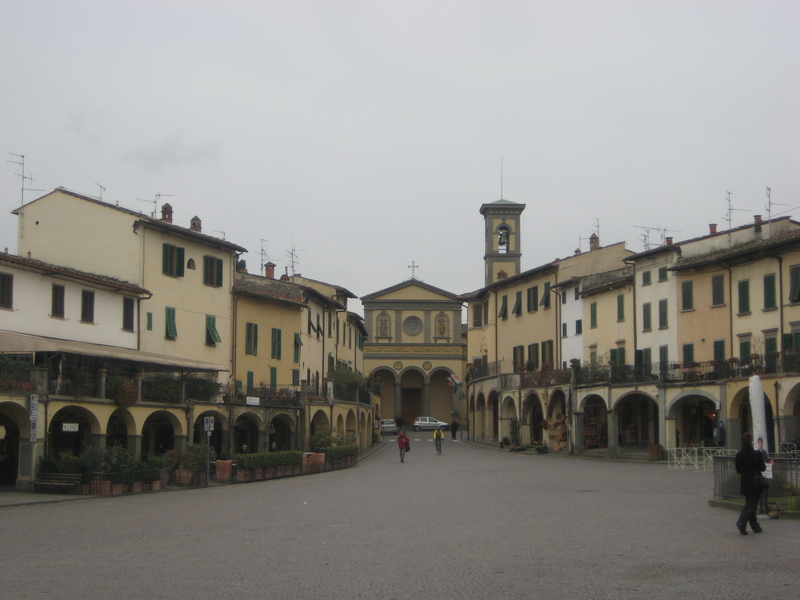 We’ve take n an inter-city bus up to Greve-in-Chianti were we walked around this delightful little town in the heart of Tuscan wine country. 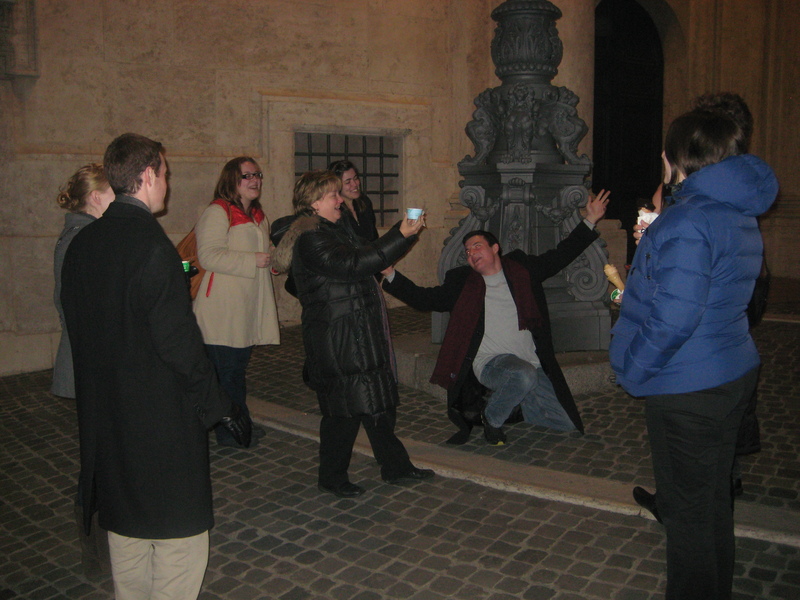 We stopped at the wine center where those who chose to could taste different wines from the region. Oenophiles know that the region is famous for Sangiovese, the grape that forms the heart of Chianti wine. But we also tasted wines blended from other grapes grown in the area. 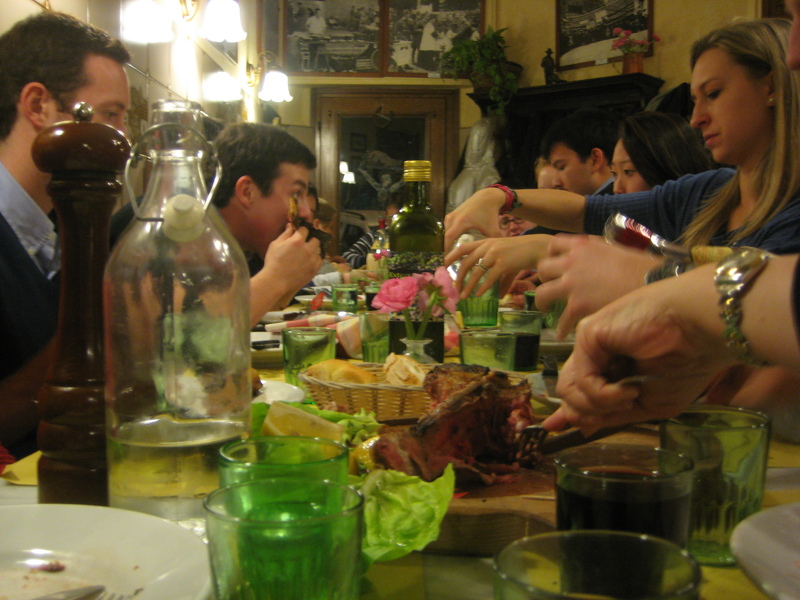 A few brave souls even tried one of my favorites Grappa, an acquired taste and note for the faint-hearted.. After our one-hour bus ride back to Florence, many of us headed to a Napolise restaurant for a taste of southern Italian cooking. The restaurant is on the other side of the river, far from the tourist center. Not only were we the only people speaking American but the menus had no English translations. It doesn’t get much more authentic. The waitress patiently explained the menu, including about two dozen different pizzas, all done in authentic Naples style. By the time we left, the big room was stuffed to capacity and so were our stomachs. On Sunday, we were out the door before 9:30, early enough to catch Florence at a quiet time. The morning light allowed us to see the city from a very different perspective. 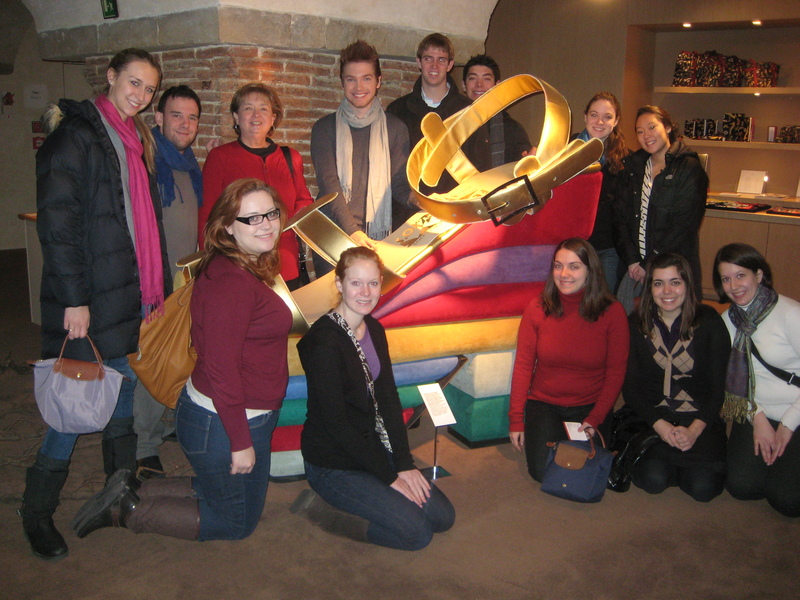 And speaking of different….we spent the morning at the Salvatore Ferragamo museum. That’s Ferragamo as in the Italian shoemaker to the stars. The old building, right by the bridge on the river, has been in the family since the 1920s. The upper floors are still the family home with the ground floor being the flagship store and the basement a museum. So, why look at shoes? 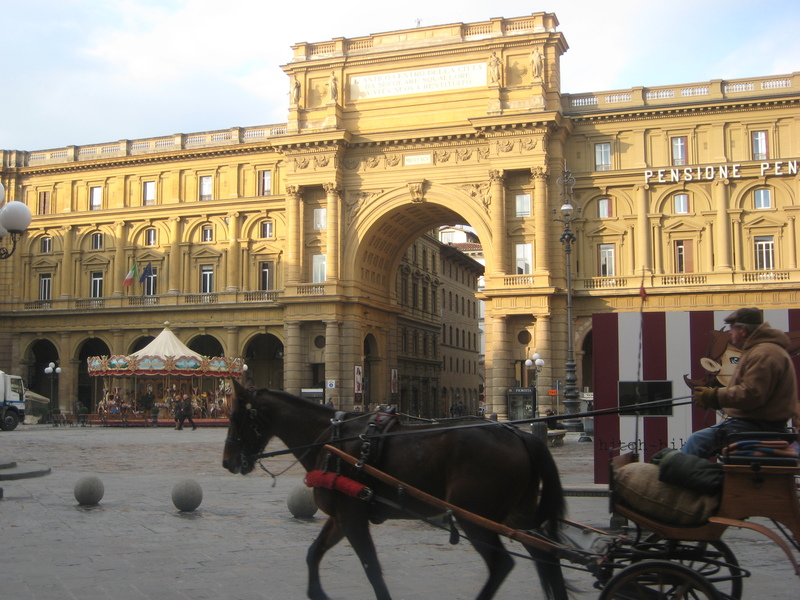 Florence is about art, in the architecture, the sculptures, the paintings and even the handmade shoes. The Ferragamo story is about Hollywood, entrepreneurship, craftsmanship and art. 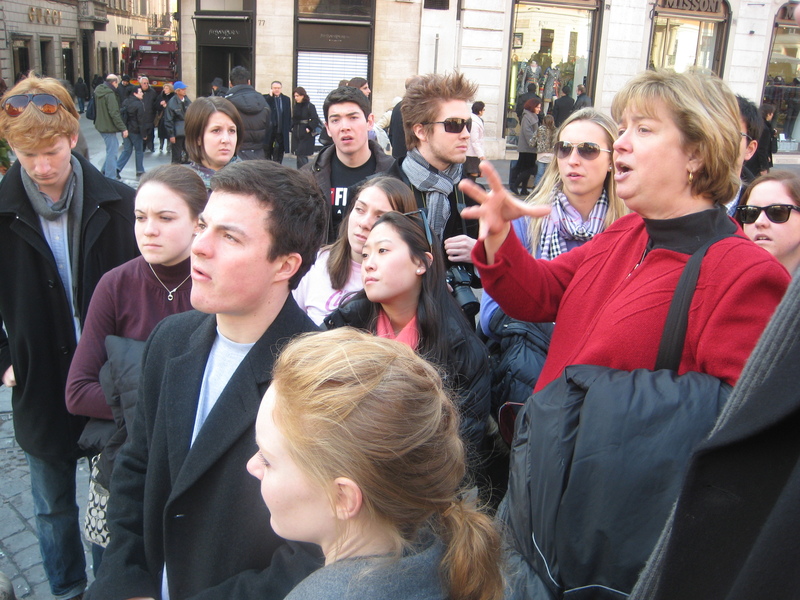 That afternoon, some of the students headed for Arezzo, the little village where “Life is Beautiful” was filmed (we showed our students this movie before we left. If you haven’t seen it, make a point to watch is sometime soon). Some other students went to a local football (soccer) game. 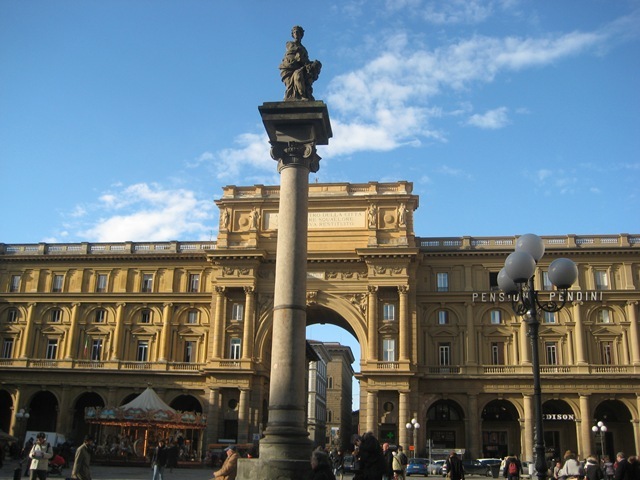 Others stayed in Florence to discover more wonders. All showed that they are making the transition from tourists following the pack, to independent travelers. Our last full day in Florence started with a morning lecture discussing what we experienced , what it means to our study of the European Union, and previewing our next stop. 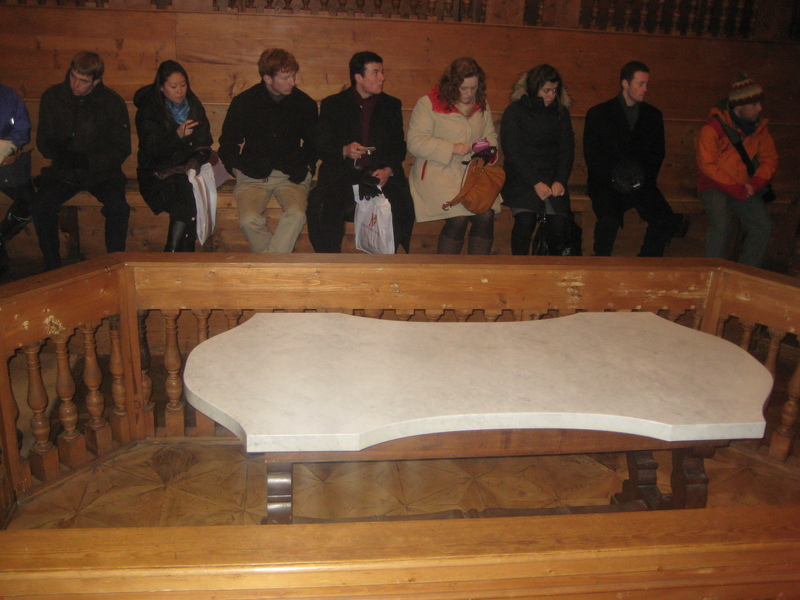 That afternoon, we took a city bus up into the hills to visit the European University Institute. 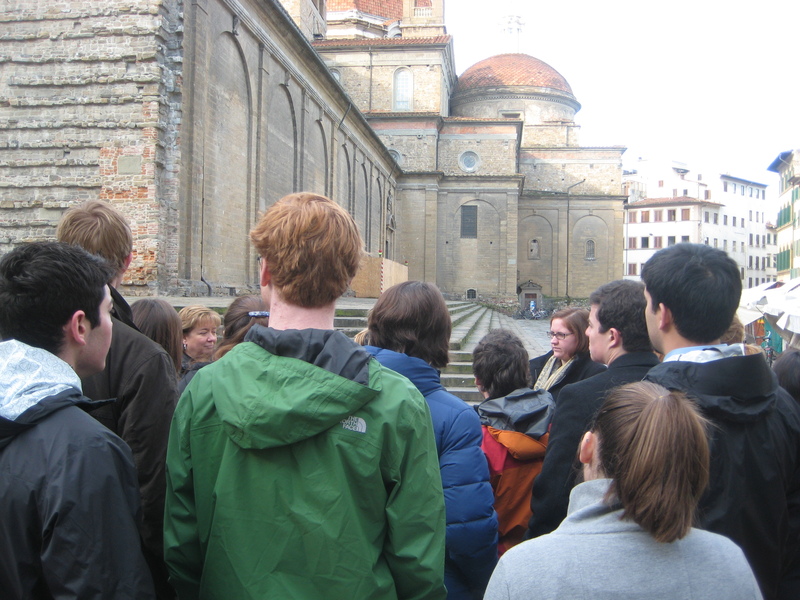 The spectacular view of Florence was complimented by the amazing old villas that house the University. 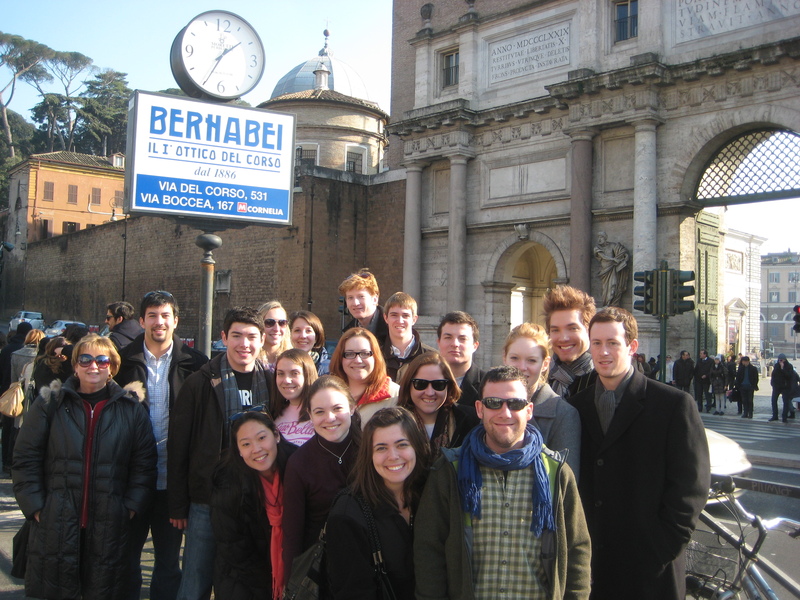 The highlight of the day was a lecture by a political science professor about Italy and its role in the current EU. 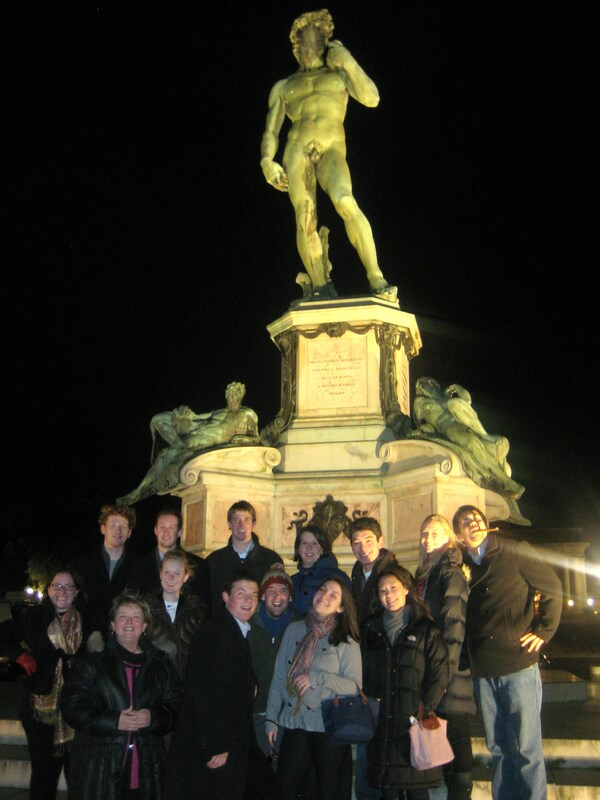 We took the bus back soon after sunset and dispersed for a last meal…and last gelato,,,,in Florence. 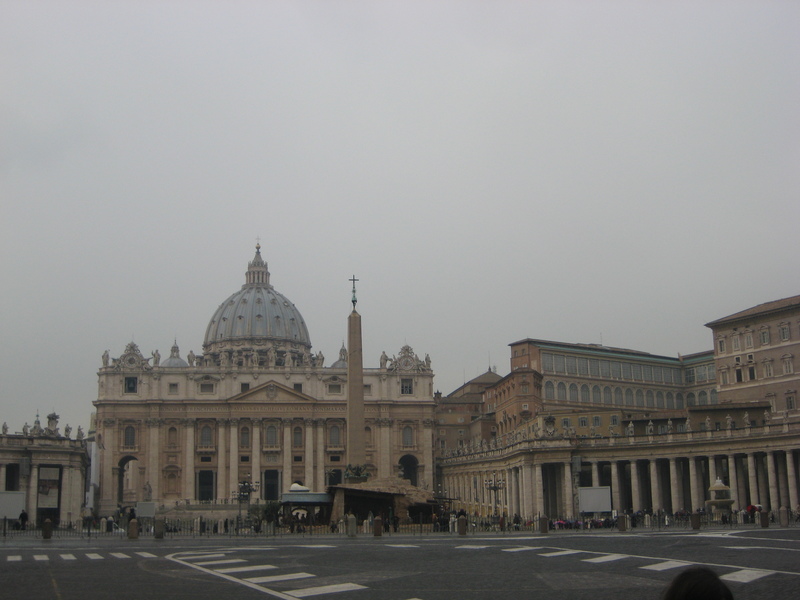 In the morning, the 90-minute express train ride to Rome. 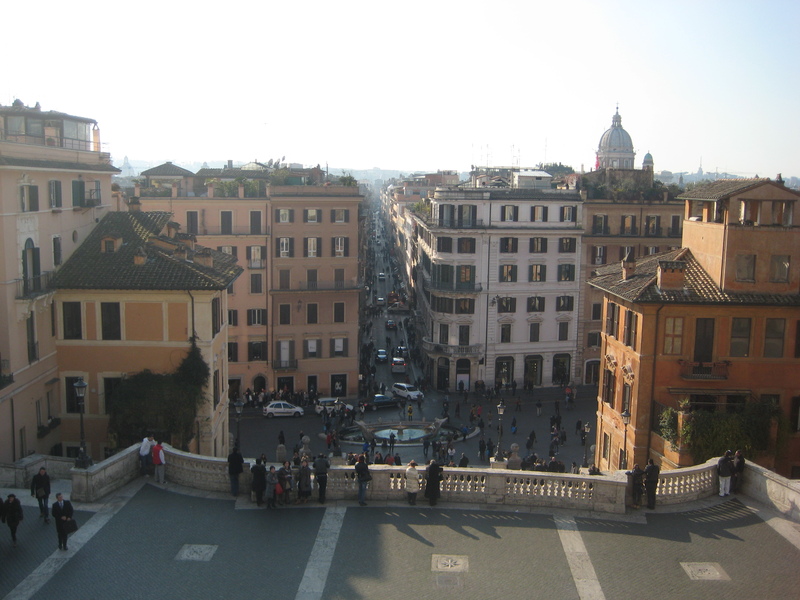 Next up: 48 hours in Rome…and then home. 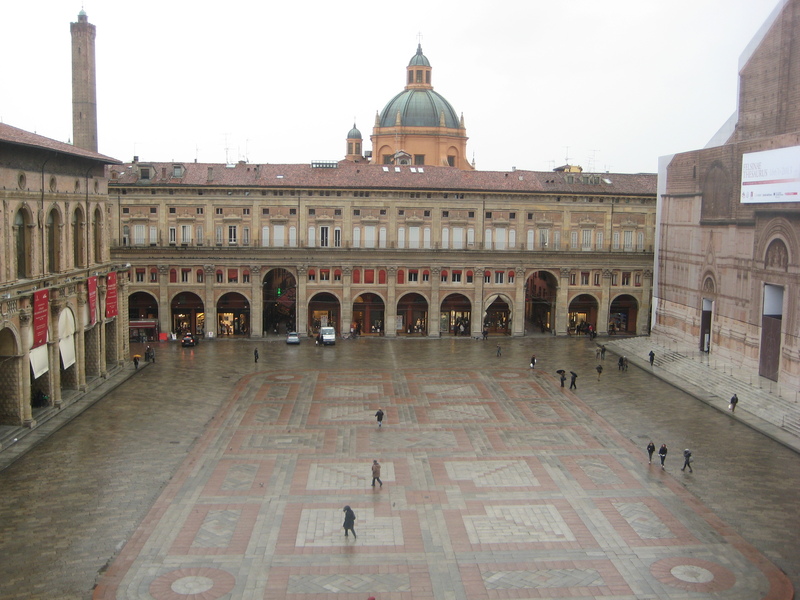 Our second full day in Florence was spent taking a day trip to Bologna. A little more than half-an-hour away, the train travels through the mountain snow and past many pretty little villages. 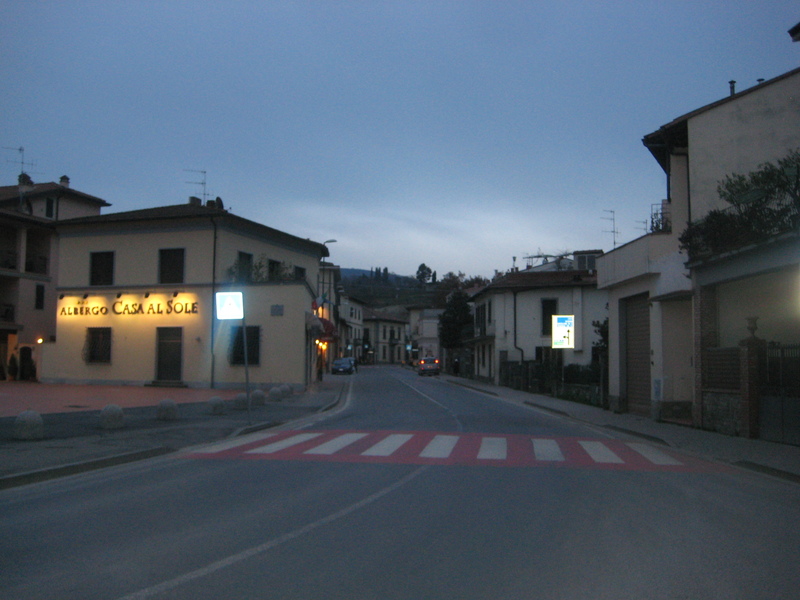 This is a town many know about (think spaghetti Bolognese) but view Americans visit. 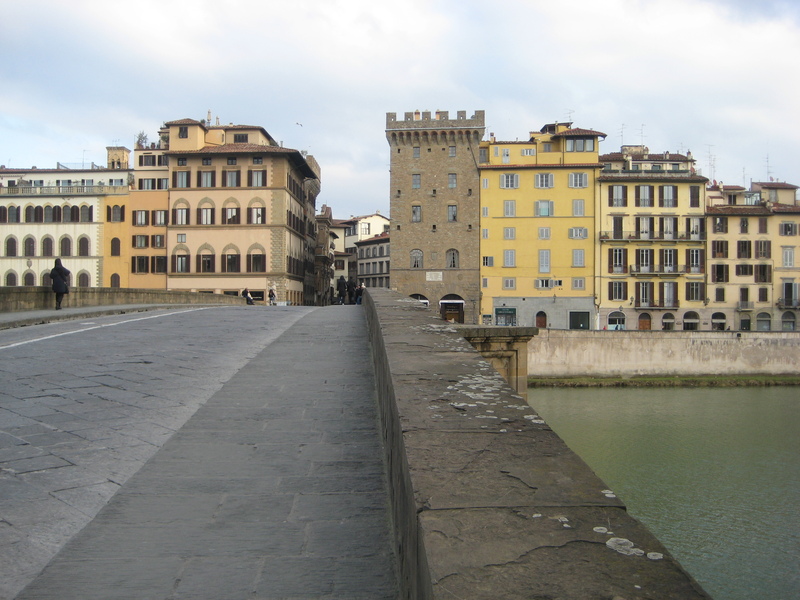 In Florence, you hear as many people speaking American as you hear speaking Italian. 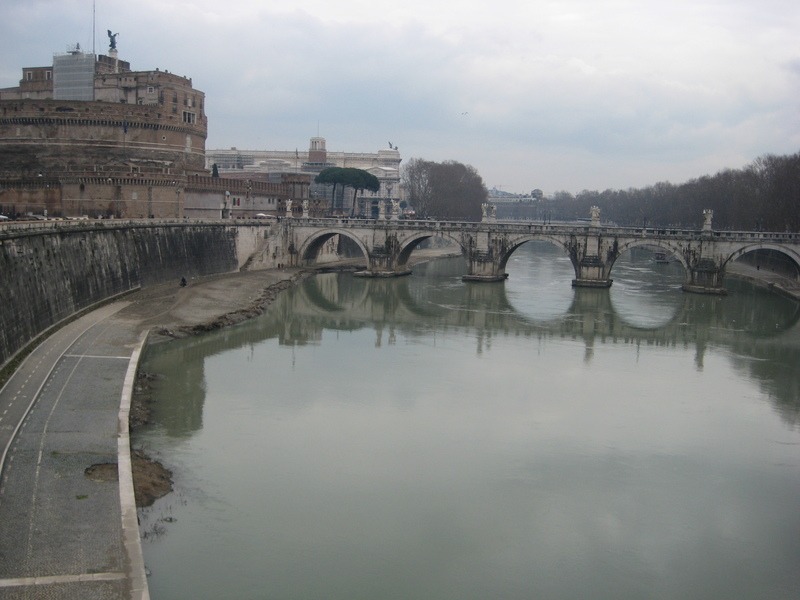 It is a beautiful place with much to see that informs our study of the European Union. 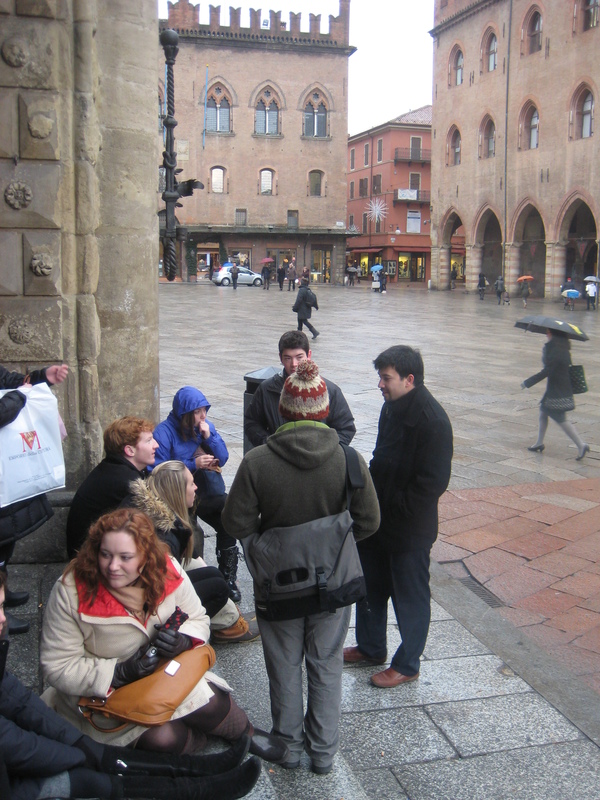 Despite the rain and cold, we walked all around the town to view the important places. 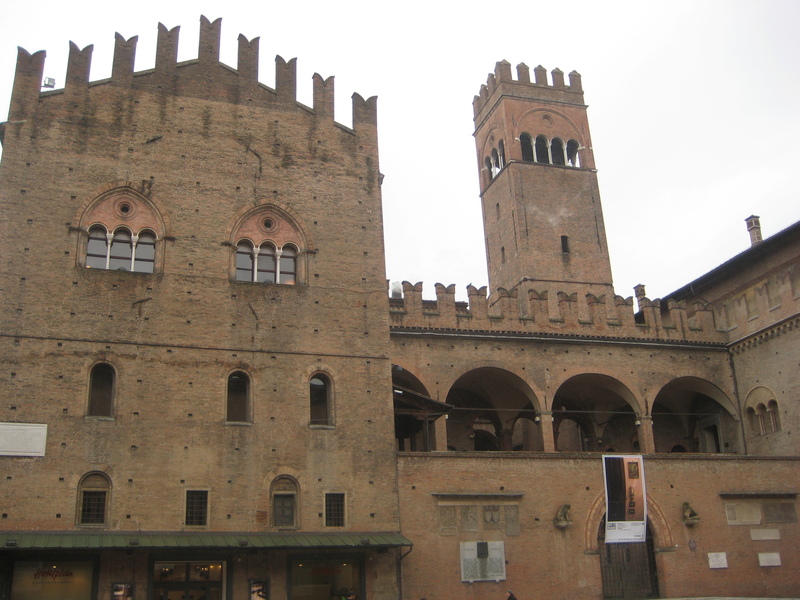 In addition to the usual palaces, Bologna is home to the oldest university in the western world, dating to 1088. 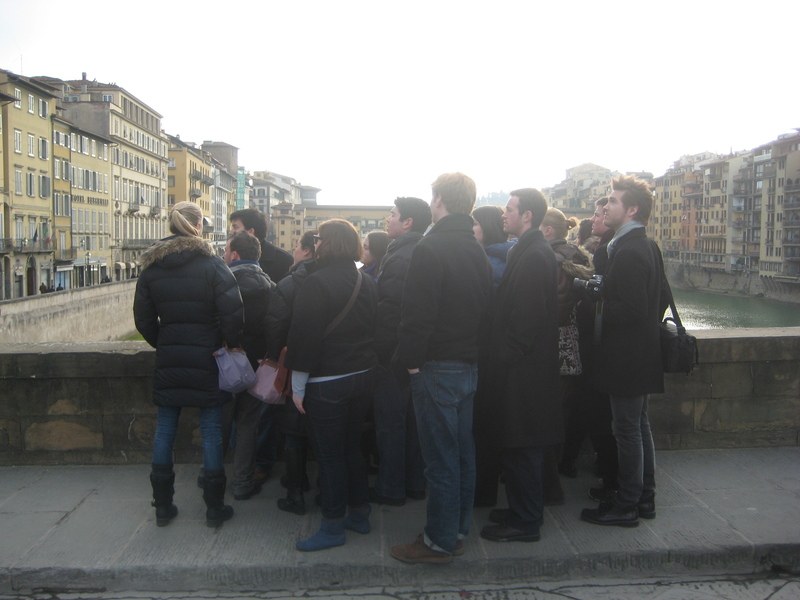 We stood on the spot where Christopher Columbus is thought to have talked about his adventures in the new world. We also learned that every student got his or her (yes, in the early days women could attend the university) coat of arms on the university wall. Students paid a bit more than the required tuition with the extra going to help those who couldn’t afford tuition. And students who did not live up to expectations could face punishment as harsh as execution. This might make for an interesting discussion at our next faculty meeting. The university was also one of the first to really explore anatomy. Students would start dissecting a body at 4 am and continue for 24 hours straight with no break for food or the bathroom. In the modern classroom, many students seem unable to go 24 minutes without walking out and using the bathroom. Have our bladders been shrinking over the last 600 years? The rest of the day was spent exploring the museums, market, shops and restaurants on our own. That line by Steve Goodman, sung by Arlo Guthrie, was running through my head as we headed into our last week and last destinations of our study of the European Union. It was our longest day of travel, with a delicious payoff. 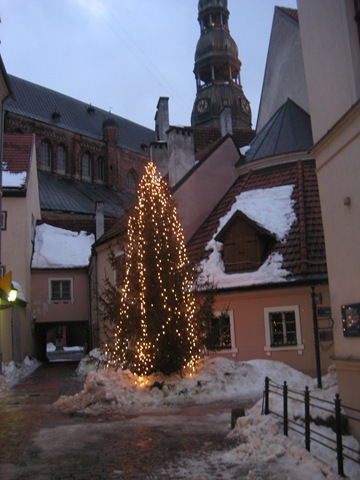 The morning started with cab rides to the Vilnius airport at 8:30 AM. We took a very modern prop plane for the almost three-hour flight to Rome. After landing at the Rome airport, and enduring all the chaos travelers know as the trademark of that airport, we took a train to the main rail station in Rome. 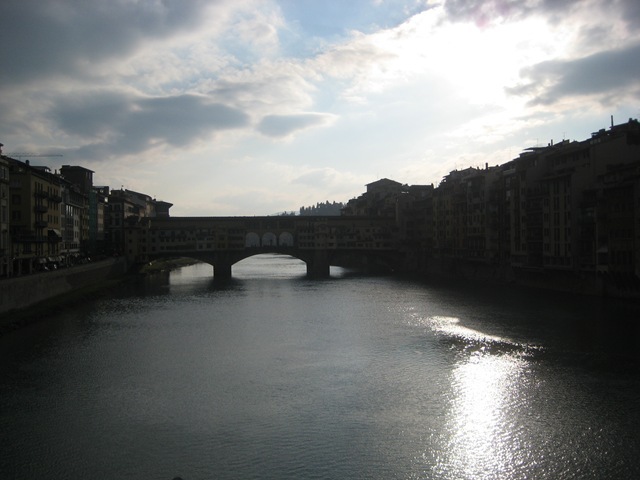 After a very long walk, without leaving the train station, we boarded our train for Florence. To pass the time, one of our students took out a deck of cards. 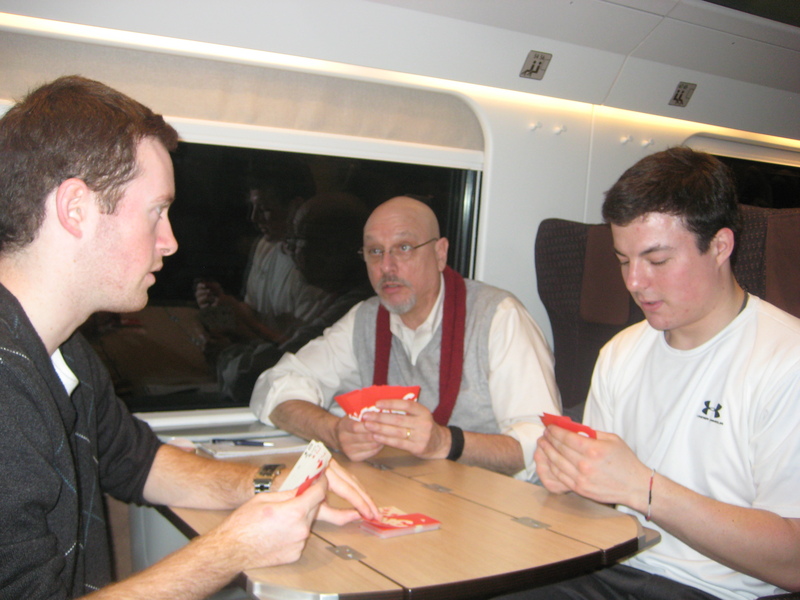 Remembering my role as a professor, I felt it was important to teach these young folks how to play my favorite card game from when I was an undergraduate. I spent many nights with my college roommate playing 500 Rummy. Our students caught on to the game quickly. Of the three of us playing, I came in second. I credit our student’s win to my excellent teaching! The 90 minute ride went very quickly and was great fun. 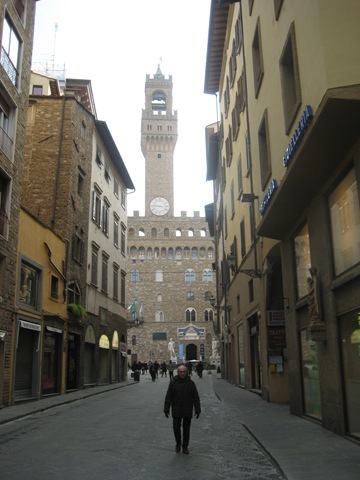 Our hotel in Florence has great character. Three generations of the same family run it and each room is unique. This is clearly not a chain and has a charm that is rapidly disappearing from hotels around the world. We quickly put our things in the room and headed out for a one hour walk around this historic city. 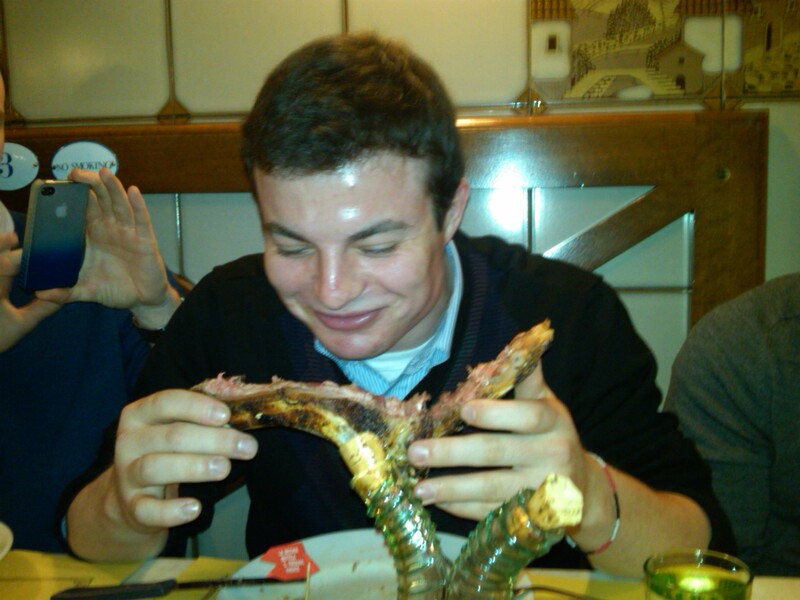 We certainly worked up an appetite, one that was satisfied at a local pizza place. We are all road-weary but holding up and laughing awfully heard. After dinner, we went to the place I have been dreaming about since my last trip here a few years ago. Grom is possibly the best gelato anywhere. The pistachio will make you swoon (if you are so inclined) or at least make you want to come back for more. We all resolved to hit this wonderful place again before leaving here early next week.